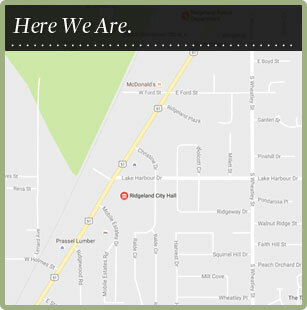 To learn about the Ridgeland Multiuse Trail System: Multiuse Trail System. Freedom Ridge Park, a 50-acre state-of-the-art athletic facility, is located at 235 West School Street, just behind the Ridgeland Police Department. The park features four lighted adult regulation softball fields, four lighted regulation soccer fields, four picnic pavilions, two playgrounds, two concession/restroom buildings, a lighted walking trail and a maintenance facility. Each of the four pavilions at Freedom Ridge Park is available at an hourly rate of $15 for residents, $25 for non-residents. The security deposit is $100. Friendship Park is a multi-purpose neighborhood park facility, located at 475 Lake Harbour Drive. With a large lighted pavilion, a one-mile lighted walking/jogging trail, a fitness court, playground equipment and restroom facilities, the park accomodates many and varying needs. The pavilion is available for rental at an hourly rate of $15 for residents, $25 per hour for non-residents, with a security deposity of $100. Park hours are 6:30 a.m. to 10 p.m.
Ridgeland Recreational Center is housed in a two-story rustic lodge overlooking the Ross Barnett Reservoir at Old Trace Park. Daily activities for Superstar Seniors as well as nightly classes for all ages take place during the week at this facility. From I-55, take Exit 105B (Ridgeland/Old Agency Road). Travel east on Jackson Street to the Highway 51 intersection. Travel south (or turn right) onto Highway 51. Turn left at the traffic signal onto Rice Road. Go approximately 2.9 miles to Post Road. (You will cross Old Canton Road. You will pass Harbor Drive and Madison Landing. The next street is Post Road.) Turn right onto Post Road and continue to the Old Trace Park entrance. The Ridgeland Recreational Center is located at the southwest corner of the park. It is a 2-story gray lodge with a picket fence around it that is situated adjacent to the Ross Barnett Reservoir. Ridgeland Tennis Center, a full-service public facility operated by tennis pros, is located at 201 McClellan Drive, off Highway 51. The center is home to 17 lighted, hard tennis courts; men’s and women’s locker rooms; a 2,000 square-foot covered porch for viewing; and a fully stocked tennis pro shop. Ridgeland City Hall, 304 Highway 51, is home to practice areas for soccer and t-ball.